The camping sites are divided into 4 blocks. The block abutting the beachfront is A Block, and the one furthest back is D block. A and B blocks share one kitchen and ablutions facility, and Blocks C and D share another. 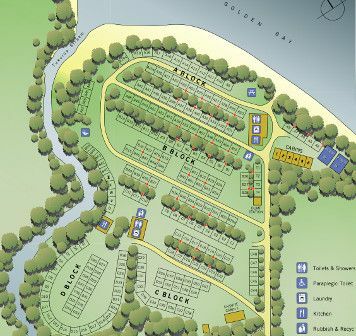 Our 70 powered sites are located throughout Blocks A, B and C; some right next to the beach, others further back. D Block is entirely unpowered. The sites vary somewhat in size. All have at least one side measuring 8m, but some are substantially larger. So if you have a large caravan, 5th wheeler or bus, or simply need a bit more tent space then give us a call and we'll put you on a bigger site if we are able. If you are booking more than one site then it would pay to speak to us directly instead of booking online. The online booking system will allow you to book more than one site, but it will assign the next ones available, and these won't necessarily be sites next to each other.